Tascam has updated the combination CD players/cassette recorders to the CD-A550 and CD-A750. Tascam showcased its BB-1000 portable recorder with built-in CD/SD recorder/player and speakers at Musikmesse earlier this month. TASCAM announces an update to its combination CD & Cassette recorder, the CC-222SLmkII. 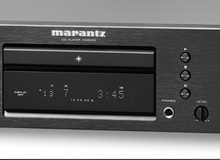 The new model includes a pitch control for the CD as well as the one for the cassette. The SS-CDR1 is now available from TASCAM retailers and installers. HHB is showing their new CDR-882 DualBurn at the 2008 NAB Show™.